A memoir of a mother's experience of raising both a gay son and a gay, transgender son that acknowledges her own upbringing in an adopted family. Through the personal narrative of raising children from birth to adulthood, the author offers insights and further resources for other parents of LGBT children. 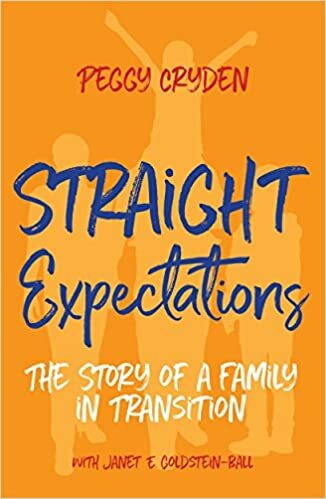 Straight Expectations by Peggy Cryden is a potentially complex story of family issues and changes within the family group. Peggy is the mother; her children at the start of this book are Julia, who has issues with her gender, and Jay her son who has issues with eating and OCD. After the general introduction to the family Peggy talks about her background as a child and then an adult. While it touches on Peggy’s family generally we do find out that her mother was certainly somewhat dysfunctional at best. Once she leaves home it is apparent that Peggy herself has a tendency towards a chaotic and complicated lifestyle. Moving on she covers the birth of her two children and their early years when she sees some signs of potential difficulties with both children although there is nothing very specific at that time. The story then starts to focus on Julia more and it is clear that Peggy is a genuinely nice/concerned mother. Peggy seems to take the view that they do not particularly want to air their issues on TV however a slot on the Oprah show would be acceptable and that call comes. I found the fact the TV appearance did lead to some consequences and that it exposed some of the differing attitudes to Julia’s problem very interesting. Julia certainly has problems to deal with in her transition process to Jake. The book moves on to Jay and his issues. This actually leads to another appearance on Oprah as a family. A foundation to help people with gender issues and transitions is set up and administered by the family and in particular the now adult siblings. Peggy herself is by now a counsellor with her own private practice and she reviews the overall situation in the USA as it relates to her children’s issues. I found the book both readable and interesting in general. It is worth noting than the “Further Reading” section has useful information in. However more particularly the potentially very useful “Resources” section offers solely USA based ones. In a sense I guess I was expecting a rather straightforward story of the changes that took place in Peggy’s children. In practice quite a lot of the book is given over to Peggy and her life rather than being fully focussed on the two children. If I had any criticism of the book it would be about that. However if the children had been the primary focus then they would have had to have their own input which doesn’t seem to be the case. I think it would be of interest to those with an interest but I’m not sure that there is really enough about Julia in this which makes it more of a “general” family story rather than a gender transition book in the main. Ultimately I found this an interesting read.